The term wet deposition refers to the removal of pollutants, both gases and particles, by condensation, or rainfall, either within a cloud or below the cloud. Naturally all the calculations in this section are just examples because the PMCH tracer does not deposit. As before, start by retrieving the previously saved deposit_control.txt and deposit_setup.txt settings into the GUI menu to reset the changes from the previous section. The base deposition configuration sets the run duration to 25 h and sets the concentration grid for two vertical levels: 0 and 100 m. Re-run the base case simulation without any deposition, if you do not already have those results. Note that the wet removal of gases is applied at all levels from the ground to the top of the cloud-layer. The cloud bottom is defined at the level when the RH first reaches 80% and the cloud top is reached when the RH drops below 60%. 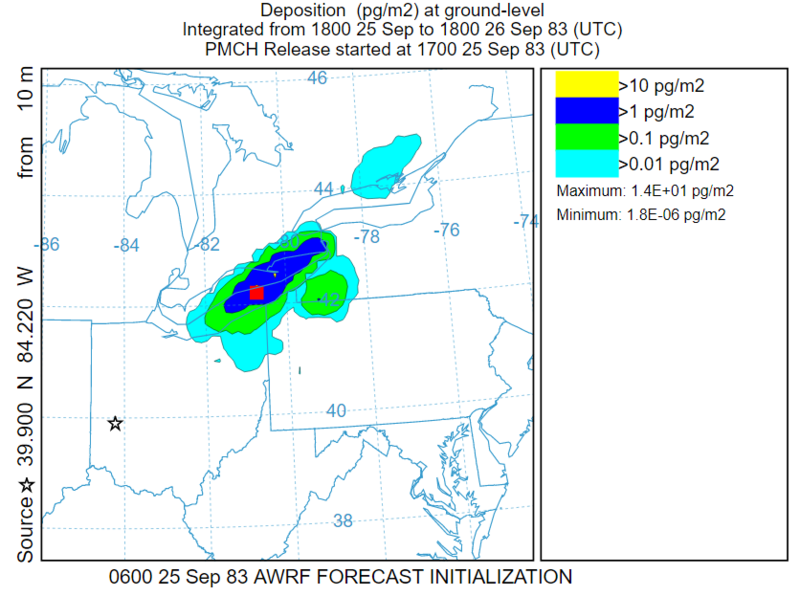 All removal amounts are adjusted by the fraction of the pollutant mass that is within the cloud layer. The wet removal time constant is added to the other removal constants to compute the particle mass loss each time step. 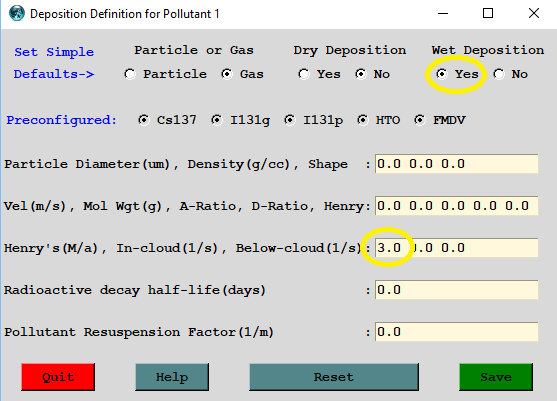 Open the Setup Run / Deposition menu and set the wet deposition radio-button to Yes to populate the wet deposition removal parameters with their default values. For gases, the default value of 3.0 is the Henry's constant for molecular iodine. In contrast, a more common pollutant, sulfur dioxide, has an initial value of 1.2 but will increase as the acidity of the raindrop increases. 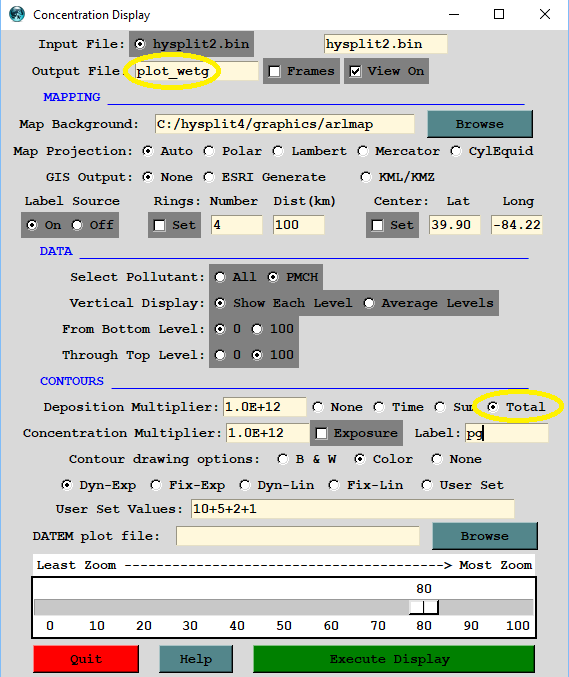 Save the changes, run the model, and after it completes, open the display menu and advance to the last frame showing the total deposition pattern. It shows two distinct rainfall areas near 41.5N 81.5W and 41.5N 79.5W. Looking at the individual time-period deposition patterns shows that wet removal occurred on the 26th between 00-03 and 06-12. 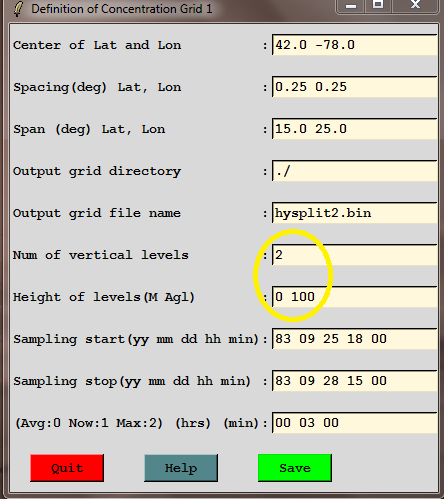 The MESSAGE file shows a total mass of 200980 grams at the end of the run. Very little mass was lost due to gaseous wet deposition compared with the no deposition simulation. In this example the wet deposition was computed for a Henry's constant associated with a specific gas. This computational approach only works if the solubility of the gas does not change as more of the pollutant is dissolved in the raindrop.